Lock in a great price for Super 8 by Wyndham Clinton – rated 8.1 by recent guests! Breakfast provided was great. Location is perfect. Bed was comfy. Tv and other appliances fine. Room is large, very clean and has an extra sink in the bedroom area. Water pressure great in shower. Bed comfortable. Only down side is the breakfast has no protein option like hard boiled eggs. Lots of cereal and toast/bagel/muffin choices. Great coffee. For the price and from the outer appearance of the property (much smaller and not as nice as it looks in the online photos) I wasn't expecting much. I was presently surprised by the kindness of the manager and the nice, clean and comfortable room. There was a nice little breakfast set up. I judged it quickly by what I saw on the outside. The room was large and very clean. The bed was comfortable. Our room was updated and clean with good heat and comfortable bed and pillows. A good Mex restaurant next door and easy on/off to I40. Left to early for breakfast. Very good value for money. The room had almost everything one could need - mini fridge with freezer, microwave, hair dryer - but the coffee maker's pot was missing. Super 8 by Wyndham Clinton This rating is a reflection of how the property compares to the industry standard when it comes to price, facilities and services available. It's based on a self-evaluation by the property. Use this rating to help choose your stay! This hotel offers a daily continental breakfast and has rooms equipped with free Wi-Fi. The hotel also features easy access to Interstate 40. Clinton town center, with shopping and dining, is half a mile away. 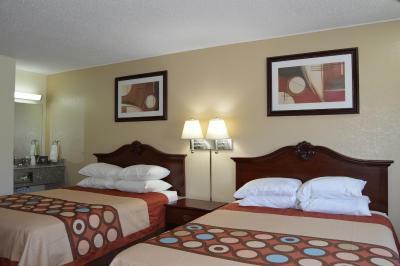 Rooms feature a 32-inch flat-screen cable TV and an MP3 alarm clock at the Super 8 – Clinton. The rooms also include a microwave, fridge, and coffee-making facilities. Guests can get a drink from the vending machines. The hotel also features free parking. The Super 8 is a 20-minute drive from the Foss State Park. The Wild West Speedway Motor Sports Park is 6 miles from the hotel. This property is also rated for the best value in Clinton! Guests are getting more for their money when compared to other properties in this city. 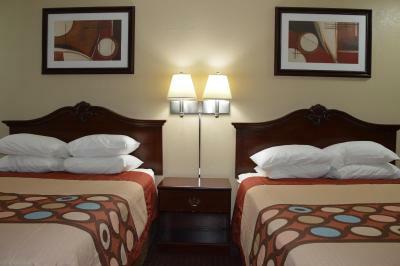 When would you like to stay at Super 8 by Wyndham Clinton? This quadruple room has a microwave, satellite TV and tea/coffee maker. This quadruple room features a satellite TV, seating area and microwave. House Rules Super 8 by Wyndham Clinton takes special requests – add in the next step! Any additional older children or adults are charged USD 5 per person per night for extra beds. Super 8 by Wyndham Clinton accepts these cards and reserves the right to temporarily hold an amount prior to arrival. The bathroom could use some upgrades. Need grips in the tub. The ones in the tub don't have grip anymore. So clean and comfortable and friendly staff. Hallways and stairs were dirty. Decor of hotel was showings its age. The property is so much smaller than it appears on online. I felt "cheated," when I pulled up to the property and saw a walk up service window. When I see a foyer locked up in the evening and business in done thru a night service window, I get anxious and I feel exposed. From past experience, it means the hotel is not in a good location and/or that the family that owns the hotel lives in it as well. It's just awkward and it feels like I am in somebody else's private space. At this hotel, I did not feel that way at all. Hotel space stayed separate from their personal living space. We booked a non smoking room, when arriving the only room available was a smoking room and the smell of smoke was horrible. Not enough covers on bed! The walls are a little thin. Other guests were noisy (talking and joking around in the hall). Staff was helpful and friendly. Room was super clean and comfortable. Location is easy access to the interstate. I made arrangements for late check out on 2/17/19 and the front desk did not have that and neither did the cleaning lady.